Dairy products are a primary source of calcium. 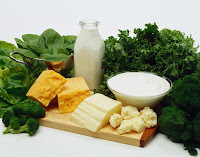 Rich plant sources in calcium include green leafy vegetables, spinach, kale, turnip greens, and tofu. The absorption rate from kale, as well as other members of the cabbage family (turnip, mustard, collard) are higher than in milk. Calcium from spinach is poorly absorbed. TRAACS (The Real Amino Acid Chelate System) are some of the most bioavailable minerals available. The amino acid chelates are bonded to the mineral and carry it into the body as an amino acid. At the correct moment – in the jejunum (middle section of the small intestines) – the amino acid chelate is absorbed and the mineral is used at its fullest potential. “The citric acid cycle is a series of chemical reactions used by all aerobic organisms to generate energy through the oxidization of acetate derived from carbohydrates, fats and proteins into carbon dioxide.” By binding or chelating an ion from the citric acid cycle to the ion of the mineral makes the mineral better absorbed because the body recognizes the chelate. An example of chelation is binding citric acid from the cycle to calcium, hence you have calcium citrate. Avoid oyster shell calcium, bone meal, and dolomite unless the manufacturer provides assurance the product is lead-free. Carbonate and oxide chelates are also less desired forms of minerals. Calcium deficiency in adults can lead to osteomalacia (softening of the bones). Extremely low levels of calcium may result in muscle spasms and leg cramps. Calcium deficiency in children can eventually lead to rickets, resulting in bone deformities and stunts growth. Long term low calcium levels may contribute to high blood pressure, colon cancer, and osteoporosis. Calcium along with other key minerals builds healthy bones and might serve as a protection against high blood pressure and colon cancer. Osteoporosis (means “porous bone”) and low calcium are synonymous with one another. Women and men both experience a decline in bone mass after the age of 40. Many factors play a role in excessive bone loss, but postmenopausal osteoporosis is the most common. Dr. Michael Murray describes bone as a “dynamic living tissue constantly being broken down and rebuilt.” Normal bone metabolism depends heavily on nutritional and hormonal factors. Twenty-four nutrients are required for optimal bone health. Calcium and vitamin D are two of the most important cogs in the wheel. Blood calcium levels work within very narrow limits. The parathyroid and thyroid glands secrete hormones to regulate normal calcium homeostasis. These hormones determine how much activity is needed for the cells to break down bone, how much calcium excretion by the kidneys needs to occur, and how much calcium absorption is needed in the intestines. Estrogen deficiency can cause cells that breaks down bone to be more sensitive to the parathyroid gland. This results in increased bone breakdown, in turn raises blood calcium levels. Dietary factors have been associated with osteoporosis – high acid diet; low calcium, high phosphorus intake from too much dairy; and an extremely high protein diet. A high fruit and vegetable diet is associated with a low risk of osteoporosis. Calcium is the most abundant mineral in the body. Bones contain more than 99 percent of the body’s calcium.